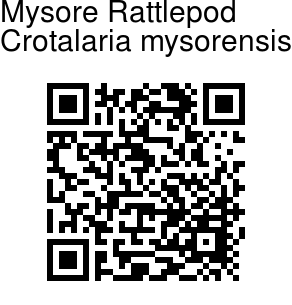 Mysore Rattlepod is an erect herb, about 1-2 ft tall. Branches are covered with long, spreading hairs. Leaf are simple, stalkless, 2.5-8 cm long, and 4.5-13 mm broad, linear-oblong, blunt-tipped, velvety, hairs silky, long, spreading. Stipules are about 6-10 mm long. Flowers are borne in a 6-9-flowered raceme at the end of branches. Bracts are leaf-like, lance- shaped, hairy. Bracteoles are 6-7 mm long, beneath the sepals, hairy. Sepals are 1.2-1.6 cm long, covered with long hairs. Upper ones are lance- shaped and the lower linear. 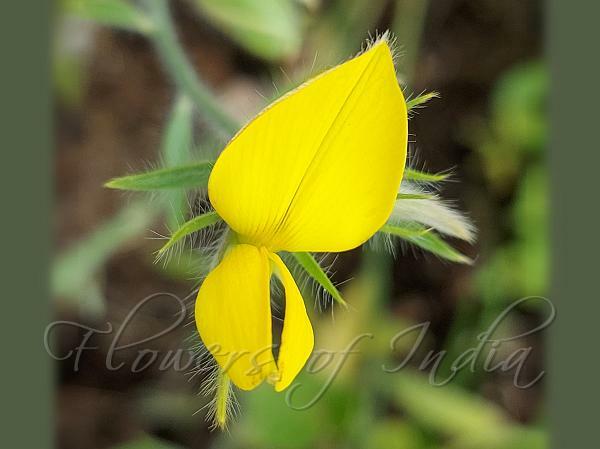 Flowers are yellow, not protruding out of the sepals. Fruit is 1.8-3.2 cm long, inflated, hairless when ripe, 20-30- seeded. Flowering: September-October.